The Samsung Galaxy S III smartphone is said to hit retail stores on May 29th in Europe, but that didn’t stop an Italian blog from getting hold of a boxed unit now, and you know what this means, video action! 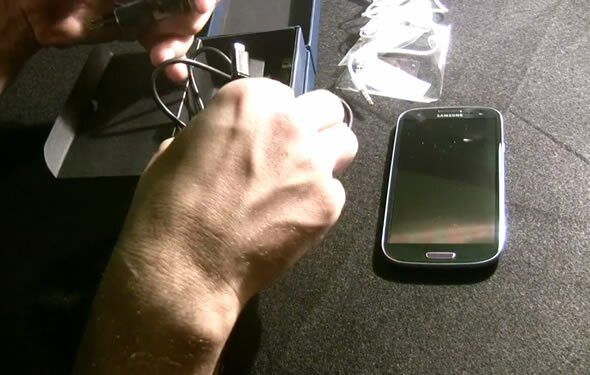 The video, which you’ll find embedded below, includes an unboxing of the most anticipated smartphone, well at least for this month, the 4.8-inch Android 4.0 Galaxy S III (SGS3). There’s also a pretty nice size comparison between the SGS3 and the Galaxy Note, Galaxy Nexus (which we’ve reviewed in great length here), Galaxy S II and the HTC One X and One S.
It’s pretty impressive that the Galaxy S III is similarly sized to the Galaxy Nexus, despite sporting a screen that’s larger by 1.5 inches, and that was achieved because of the smaller bezel. You’ll also find a brief encounter between the PenTile Matrix Super AMOLED display of the Galaxy S III and the standard RGB Super IPS LCD2 of the HTC One X, though it doesn’t help settle the argument of which is best. For that you’ll have to check out our shootout of the two display technologies right here.